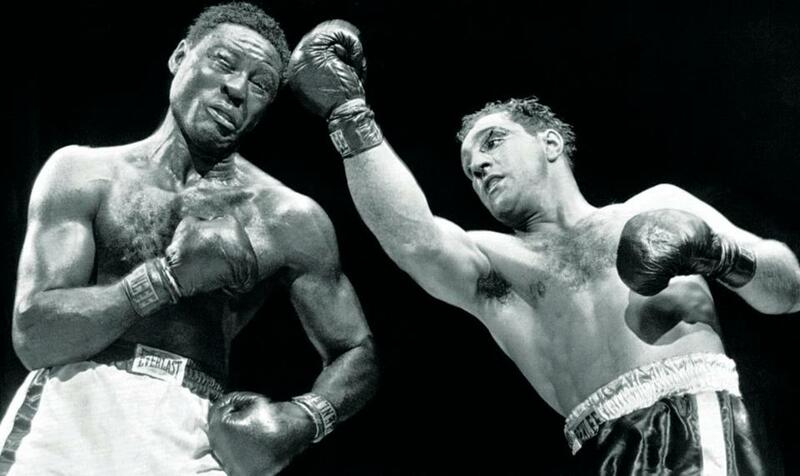 Marciano in a 1954 heavyweight bout with Ezzard Charles. Rocky Marciano came to our high school in Boston for a sports night in the mid-1960s. He was wearing a necktie and a dress shirt and when he rolled up his right sleeve and flexed his prodigious biceps the photo was featured in the yearbook. We were second-graders when he retired, but we all knew two things about him. He was from Brockton, and nobody ever defeated him in the prize ring. It has been nearly half a century since Marciano was killed at 45 when his small plane slammed into an oak tree in an Iowa cornfield on Aug. 31, 1969, and more than four decades since Everett Skehan’s dialogue-rich biography that could have doubled as a screenplay. In “Unbeaten,’’ Mike Stanton aims to bring the legend to life for a new generation. He delivers a meticulously researched and eminently readable account of the only heavyweight champion who exited a savage sport with a perfect professional record — 49-0 with 43 knockouts, 26 of them in the first three rounds. Stanton, a former Providence Journal investigative reporter who chronicled former mayor Buddy Cianci’s colorful and corrupt career, does a deft and detailed job of recreating Marciano’s journey through a violent and venal profession, with a direct style that pulls no punches. Marciano may have been a hometown hero, but he also spent nearly two years in a military prison for assault and robbery after a night of drinking, cozied up to gangsters, and was a persistent philanderer. “I don’t think he was real happy with himself for some of the things he did,” his brother Peter mused. Marciano’s “fight for perfection’’ was limited to the ring, where flaws could be atoned for with one punch. What set Marciano apart was what Goldman called his “Suzie Q,’’ a short right cross that left rivals loopy and legless. None of the journeyman pugs whom Marciano flattened in his frequent Providence bouts could stay in with him, but it wasn’t until he narrowly outpointed unbeaten Roland LaStarza at Madison Square Garden that Marciano was recognized as more than a local banger. Marciano came into his prime and popularity in the early 1950s when boxing, now both televised and controlled by mobster Frankie Carbo and his minions, hadn’t had a white champion since James Braddock in 1937. To earn his title shot Marciano first had to vanquish his faded boyhood idol Joe Louis, who was fighting to pay back taxes. “I’m sorry it had to be me,” he told the 37-year-old Louis after knocking him out of the ring and ending his career. Marciano would defend the crown six more times, including an epic finale against Archie Moore in 1955, before deciding to hang up the gloves. There was nobody left to knock out; the bouts were becoming tougher; and his hunger had vanished. “I’m too proud to let Marciano beat Rocky Marciano,” he said. Business connections, endorsements, and paid appearances soon made him wealthy, but his Depression-child frugality and distrust of banks made Marciano obsessed with stashing cash in obscure places (which his survivors couldn’t find), collecting from his small-time debtors, trying to bargain down $20 utility bills, and stiffing the phone company with slugs at pay phones. Though Marciano envied his sisters’ domestic lives he was unfulfilled by his own and he and his wife, Barbara, drifted apart. To try to salvage the marriage in 1968 they adopted a baby boy, believed to be Marciano’s biological child by a Florida woman, and named him Rocco. John Powers is a former Globe sports reporter who has co-authored histories of the New York Yankees and Fenway Park.